SKOKIE, IL— For more than 30 years, AZEK® Building Products has been an innovative leader in designing and providing premium decking products. And now, the brand is bringing the latest in deck design technology directly to contractors and consumers with a new app update. AZEK’s updated app combines its signature user-friendly experience with the success of its recently launched Deck Designer. 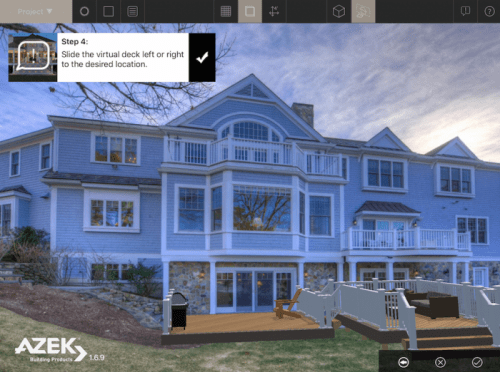 Updated to give customers the opportunity to bring their dream outdoor living spaces to life, the new app makes it easy to lay out unique, 3D designs using 140-plus product options that include premium AZEK and TimberTech decking, railing, lighting and accessories. When those custom designs are complete, consumers can then download a list of materials that they’ll need during the construction process. The app also helps locate local contractors and dealers. AZEK Building Products is a leader in the development of premium, low maintenance exterior building products. Available to a worldwide audience, its product lines span AZEK Trim, Deck, Rail, Moulding, Porch and Pavers as well as capped wood composite Decking and Railing under the TimberTech brand. Both brands, synonymous with quality, style and innovation, are made in America and lead their market areas by continually reinventing product lines and redefining product categories. For more information about AZEK, visit www.azek.com. For more information on TimberTech, visit www.timbertech.com or call 1-877-ASK AZEK. SKOKIE, IL—AZEK® Building Products, a leader in the development of premium composite decking, is raising awareness alongside the North American Decking and Railing Association (NADRA) this May for Deck Safety Month®. As summer approaches and people begin to enjoy their outdoor living spaces, it is the ideal time to address and fix any poorly maintained or unsafe decking structures. SKOKIE, IL— Discovering earth-friendly finds makes consumers feel good about a purchase, and sometimes those products are in the most surprising places. With Earth Day approaching on April 22, AZEK® Building Products, a leading provider of premium decking, railing, trim, moulding, porch and pavers, is celebrating its year-round commitment to sustainability by supporting the National Forest Foundation. The goal – collect $5,000 to plant 5,000 trees. During the month of April, AZEK Building Products will donate one dollar for every Facebook share it receives on special Earth Day posts. The objective is to reach up to 5,000 shares, or the equivalent of a $5,000 donation to the National Forest Foundation. This campaign reinforces AZEK Building Products commitment to reducing its carbon footprint through clean manufacturing. AZEK Building Products reduces the amount of waste sent to landfills every year, ships its products by rail to save thousands of gallons of fuel annually, and saves hundreds of gallons of water each day during manufacturing, with a uniquely designed, closed-loop water filtration system. Also, AZEK Building Products’ TimberTech® decks are made from up to 73 percent recycled material. AZEK Building Products is a leader in the development of premium, low maintenance exterior building products. Available to a worldwide audience, its product lines span AZEK Trim, Deck, Rail, Moulding, Porch and Pavers as well as capped wood composite Decking and Railing under the TimberTech brand. Both brands, synonymous with quality and innovation and made in America, lead their market areas by continually reinventing product lines and redefining entire product categories. For more information about AZEK, visit www.azek.com. For more information on TimberTech, visit www.timbertech.com. AZEK Building Products saves 100,000+ trees a year. Supporting data can be found on its website. 2On average wood decks last 10-15 years. 2016 Freedonia Wood & Competitive Decking Study.